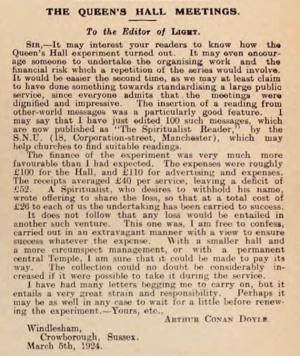 The Queen's Hall Meetings is a letter written by Arthur Conan Doyle published in Light on 15 march 1924. Sir, — It may interest your readers to know how the Queen's Hall experiment turned out. It may even encourage someone to undertake the organising work and the financial risk which a repetition of the series would involve. It would be easier the second time, as we may at least claim to have done something towards standardising a large public service, since everyone admits that, the meetings were dignified and impressive. The insertion of a reading from other world messages was a particularly good feature. I may say that I have just edited 100 such messages, which are now published as "The Spiritualist Reader," by the S.N.U. (18, Corporation-street, Manchester), which may help churches to find suitable readings. The finance of the experiment was very much more favourable than I had expected. The expenses were roughly £100 for the Hall, and £110 for advertising and expenses. The receipts averaged £40 per service, leaving a deficit of £52. A Spiritualist, who desires to withhold his name, wrote offering to share the loss, so that at a total cost of £26 to each of us the undertaking has been carried to success. It does not follow that any loss would be entailed in another such venture. This one was, I am free to confess, carried out in an extravagant manner with & view to ensure success whatever the expense. With a smaller hall and a more circumspect management, or with a permanent central Temple, I am sure that it could be made to pay its way. The collection could no doubt be considerably increased if it were possible to take it during the service. I have had many letters begging me to carry on, but it entails a very great strain and responsibility. Perhaps it may be as well in any case to wait for a little before renewing the experiment. — Yours, etc. This page was last edited on 2 October 2016, at 14:47.